In a very large bowl, dissolve the 1 tsp. of sugar in the lukewarm water and sprinkle the yeast over it, let it stand for 10 minutes. Combine the softened yeast with the lukewarm, scalded milk and 3 cups of flour, beat with a spoon until smooth. Cover and let this “sponge” rise in a warm place until light and bubbly (about an hour or so). Add the beaten eggs, sugar, melted butter and salt; mix thoroughly. Stir in enough flour (one cup at a time) to make a dough that just starts to come together. Turn out onto floured surface and knead in remaining flour until it becomes smooth and satiny, about 10 minutes. Place in a large bowl, cover and let rise in a warm place for an hour until double in bulk. Punch down and let it rise again. Divide the dough into 5 round balls (or make into small buns about 2 inches in diameter). 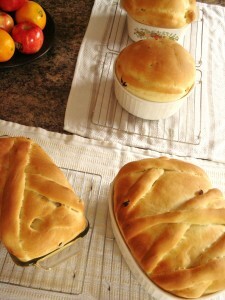 Place each in a greased round pan and let rise again in a warm place until double in bulk. Brush very carefully with an egg white diluted with about 2 tbsp. of water. Bake at 350F for about 30 minutes until golden. Debbie, If you have enough room, place the rising bread in a cold oven with a bowl of hot water under the grate. No draft, controlled warmth and the humidity keeps the dough from drying out without covering it. Works for me every time. Thanks Lydia! Love the tip about the hot water!